Finding wine that has not been filtered through animal products can be difficult. The most accurate way to find out if a wine is acceptable to you is to contact the winery and ask specifically what is used in the fining process. In your wine vegan? Check here to find out. Another list of vegetarian and vegan wine can now be found at Vegan Wine Guide. 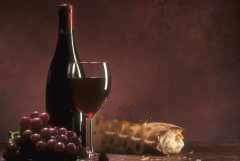 A few online retailers of vegan wine can be found here.